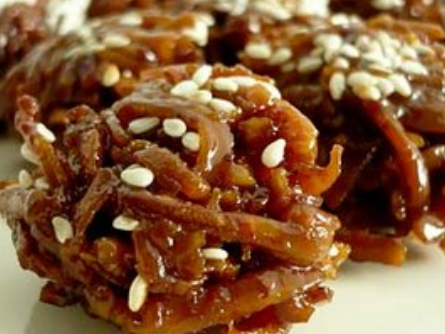 This sweet delicacy made from coconut meat can be an ideal home-based business idea. Learn how to make bukayo. <>Bukayo is a popular Filipino pasalubong that originated from Quezon and Aurora provinces. It is made from coconut meat strips that are cooked in white or brown sugar and served as an afternoon snack or dessert. It can be a very promising business opportunity for home-based or part-time entrepreneurs who target the market’s sweet tooth. Its preparation and cooking time can last from about 30 to 40 minutes. You will use a pot and a frying pan. All of the ingredients can be bought at the nearest marketplace. 1. Boil young coconut juice together with sugar and pandan leaves in a pot. Constantly stir until the sugar dissolves. Continue to cook over medium heat until the mixture thickens. 2. Carefully remove pandan leaves and add vanilla extract. Stir thoroughly. 3. Meanwhile, pour oil into a frying pan. Put the coconut meat (grated or strips) and stir fry until it turns light brown. Remove from the pan and drain cooking oil. 4. In a separate bowl, dissolve all-purpose flour or cornstarch in a tablespoon of water. Pour the solution to the cooked coconut meat. 5. Put everything into the sugar mixture. Blend well until it caramelizes. 6. Carefully remove the cooked bukayo from the pot while it’s still hot and transfer into a bowl or plate. Cautiously form it into any shape (preferably into a ball) using plastic wraps or wax paper. Let it cool down for it to solidify attractively.